Hoverboards are all the hype these days – thanks to a large selection of celebrities uploading videos on all major social media (Twitter, Vine, YouTube, Instagram, etc.) of themselves riding these wickedly-awesome devices. Manufacturers and marketing teams quickly realised the err of their sales prices, and quickly lowered the price tag of many self-balancing scooters across the board for the general public. It’s not hyperbole in the least to say that hoverboards took the world by storm during the past few years. Scooters take a while to get used to if you rode one before. That’s okay. A day or two of practice and you’ll have the fundamentals down. As with anything in life, the more time you spend doing something, the more efficient you’ll become at doing it. If you’ve never ridden one before, don’t get mad at yourself or upset if you struggle with “getting used to it.” Everybody starts somewhere. And, believe it or not the SagaPlay F1 is an incredible entry-level self-balancing scooter to consider. Despite the relatively small size, the SagaPlay F1 comes with two 250W motors. These dual motors make it a breeze for the scooter to climb 15-degree steep slopes. Compared to other boards, this one is small – and easy enough to pick up and take with you wherever you go (much like a skateboard). This portability is an issue for other, hunky, clunky boards that need a carrying bag to lug it around. Not the SagaPlay F1. The board’s battery itself only needs a bit over an hour and a half of charge time for optimal juice. This is excellent time, as most balance boards require 2-3 hours to charge the battery to maximum capacity. An hour and a half gives you time to get any business done you have planned for that day. I personally find it incredibly useful to “check up on the world” through Twitter and Facebook while the hoverboard is charging – especially when in a new town. This downtime also gives me time to find local cuisine and lunch hotspots for good eating. I’ve found a few great diners this way – diners I was too busy to notice whenever I drove by thousands of times by car. Once the battery’s fully charged, you can take it out and ride it for one full hour (if your session is a straight, continuous run with no stops). The Sagaplay F1 is rated IP56 which means it’s water-resistant, but not waterproof. You can ride this thing with ease in a super-light pour with no worries of water damage – but stay out of hard downpours. If your board accidentally lands in a deep puddle or pool: say sayonara. In the case an accident does happen to the board, and it breaks or malfunctions, you’re protected by a 1 year limited warranty on all parts – directly from the manufacturer itself. The listing price (whether you buy from Amazon or the SagaPlay website) varies between ~$300-400. While this self-balancing scooter carries a heavier price tag than others, it is certainly less expensive than other hoverboards on the market, such as the EPIKGO and Halo Rover – and ones that have a lot less features, to boot. 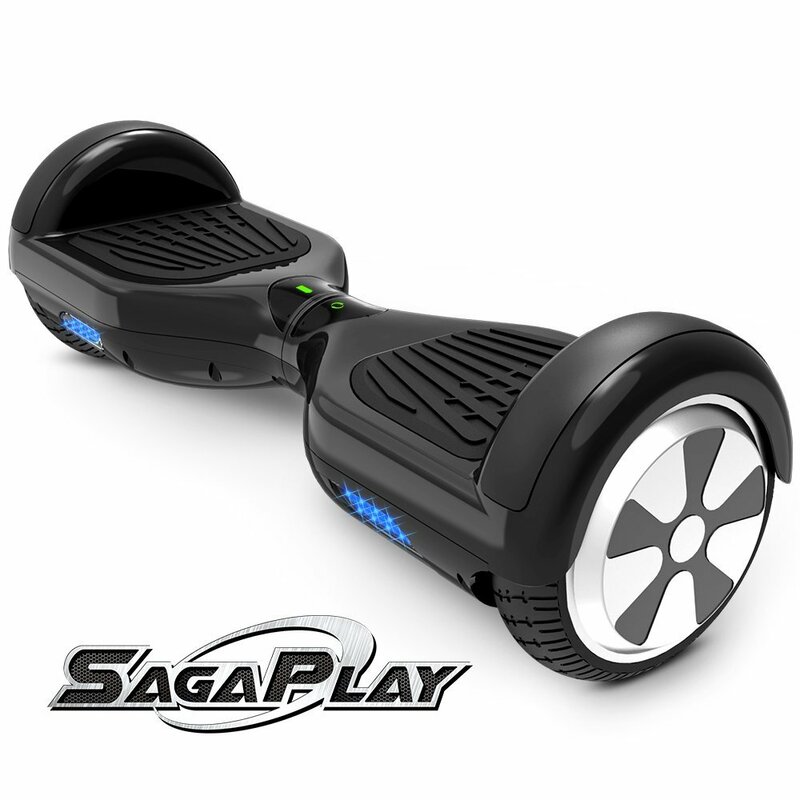 In fact, at less than $300 the SagaPlay F1 is an extraordinary entry level board for newbies and beginners to familiarise themselves with hoverboards. Once you become amazing at riding, the SagaPlay will be no obstacle for you: since it is 22 lbs., it’s one of the lightest boards you can buy – and this lightweight-ness lets you perform tricks and slides easier than heavier boards on the market. Thanks to the omni-directional design, changing directions (quickly) and speeds (again, quickly) is easy as moving your feet, without your aerodynamic turns suffering, in any direction. This is part of the fun of hoverboards – you can’t put a price on feeling free as can be. In either case, self-balancing scooters are pure fun. They’re a wonderful addition to the 21st century’s high-tech gadgets us old-timers only dreamed about in the early and mid nineties.